4. The artist used slab building and sculpture. 6. 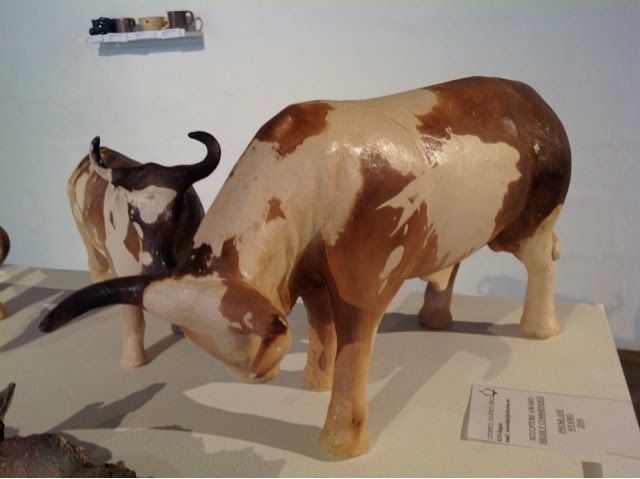 I selected 'Nguni Bull' to study as it has both beautiful (smooth curves of the bull and the natural colouring) and dangerous aspects (the stance of the bull indicating an attack/defensive position) It is an endearing piece that depicts the true beauty and grace of the bull. 7. Line: the lines of the bull's body are curved to create the body of the bull and are natural. Colour: varying tones of browns, ranging from a black-brown to creamy whites. Shape: organic shape of a bull. 8. The artist is well established, with this particular piece being awarded highly recommended. 9. The piece is displayed along with three other sculptures of bulls with similar colouring but in different stances, it is the biggest of the three sculptures. 10. The 'Nguni Bull's' use is purely for displaying purposes. How do we tell one shape from another & different colors? We rely on pictures, shapes and colors to get through ordinary life. In the past it was imageless. Images have created our world today. 2D images are the collection of pencil lines on paper so you can see what you want everyone to see. We don't know how prehistoric artist found the ability to create images. 2000 years ago we had no problems drawing 3D pictures and almost 1200BC people knew how to draw. In Northern Spain, Altamira a 9 year old girl, Maria, made a discovery. Maria and her father went to a unknown cave. They thought it was incapable for people to have lived in this cave. Maria made the discovery which made the country famous. She discovered cave paintings. These cave paintings are one first gallery of prehistoric art. The art mainly consists of an animal, orox (spices of ox that's extent). These images were so good it was unthinkable that cave people did it, the paintings were ancient. 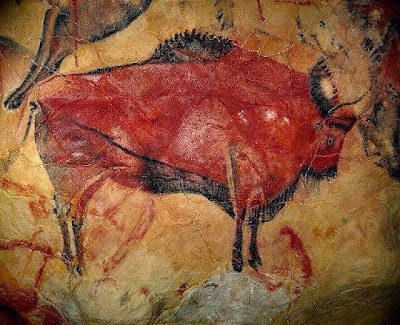 "The cave walls were festooned with striking pictures of horses and bulls that date from the Ice Age, all rendered with exquisite sophistication and symbolic force. Upon exiting the cave, an awed Picasso declared, "We have learned nothing in twelve thousand years." "
Now a days we paint anything. 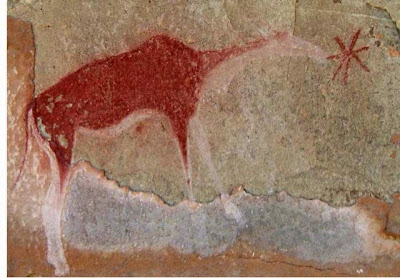 Prehistoric artist loved painting animals - horses, reindeer etc. Their subject matter not just anything. We believed their paintings were about hunting, maybe they thought it would improved the chances of a good hunt (if you capture the animals while painting, you can capture it while hunting). But, this doesn't match up as they are not painting the animals they are eating, they painting other animal (mammoths or rhinos, but they are eating goat and deer). Therefore the "hunting" theory was wrong. 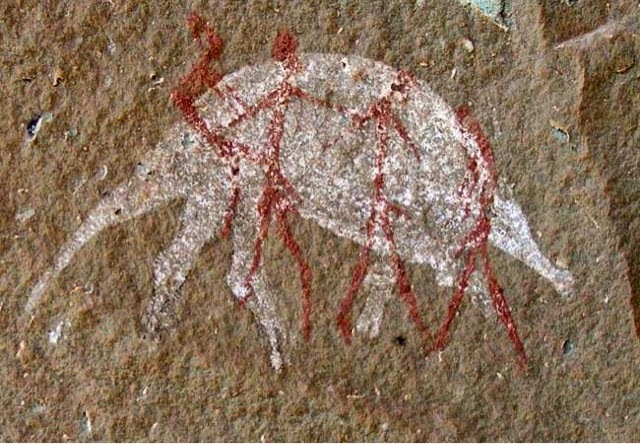 Prehistoric artist painted in narrow caves, where no one can see them, they are not outside where everyone can see them. Whats more wired is that all prehistoric artists are painting the same thing all around the world and they have no connections. They use squares and circles (which didn't exist in those times), spots and other shapes on top of horses and other animal paintings. You need to know how to paint a picture in order to paint it. A picture represents something in the world and someone who has never seen a picture can't understand what a picture is, unless you've seen it before. How did prehistoric artists know that collection of line dots and colors can make something? In South Africa, Darkensberg there was also prehistoric art. It was not thousands years old, but was done couple of 100 years ago. The San people were responsible for South Africa's prehistoric cave art. They had strange points in their paintings, like animal heads in human bodies etc.. Their religion was built on traveling to a spirit world, which still happens today, when is someone sick, you go help them in "another" world. Shaman is the leader who performed the ritual. The rhythm makes you go into a trance then you fall down to ground unconscious and this is where they supposedly visit the spirit world. There are parallels of the men and the animals dying, the paintings were about their spiritual traces. They are drawing what they see while hallucinating. People were familiar with the visuals they saw while hallucinating - this is how they new how to do 2D paintings. Romans controlled most of Europe. Theodosius split it into western Roman Empire and eastern Roman Empire. Huns, Goths, Vandals and Francs created chaos by constantly fighting and invading Europe. Known as dark ages as not enough time to do art. Many years later Europe had been split into many empires but controlled by the Roman Catholic Church. Iconoclasm sought to removal and destruction of paintings and sculptures. Didn't want people to look at physical beauty but spiritual beauty. Churches had veiled Mary but mostly had geometric patterns on walls. Churches are in control, so art often used religion as subject matter. West was a patron of the art because of the church therefore they had more freedom to do art. Put 'maximianvus' In front as he is more important and has his name but can't make him look better as Justinian paid for it. Maximianvus feet are in front but top half of his body is at the back. Justinian and his wife are facing each other. Title: Justinian and his attendance. 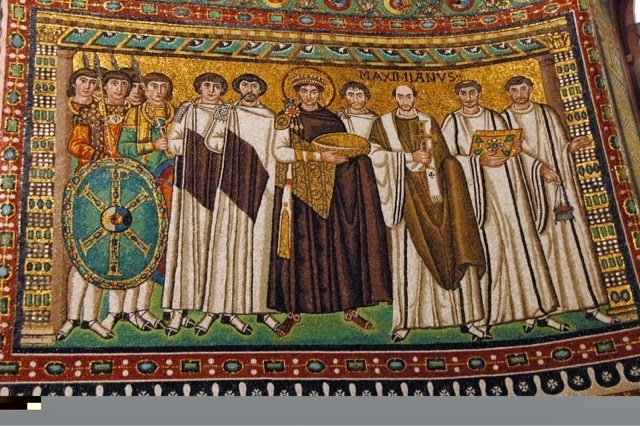 Description: Emperor surrounded by his army and members of the church. Vertical lines make figures more prominent, easier to see as church had no electricity. Tone: Justinian(main figure) is in dark tone which creates a focal point. Lots of gold has been used as it is symbolic of "God" and wealth. Texture: Not naturalistic, visually quite flat. 1. Kwazulu natal society of art. 2. Ceramics association of Southern Africa and Interpreting ceramics. 3. Seascape, louise jennings, clay, R1500. 4. Coil building. 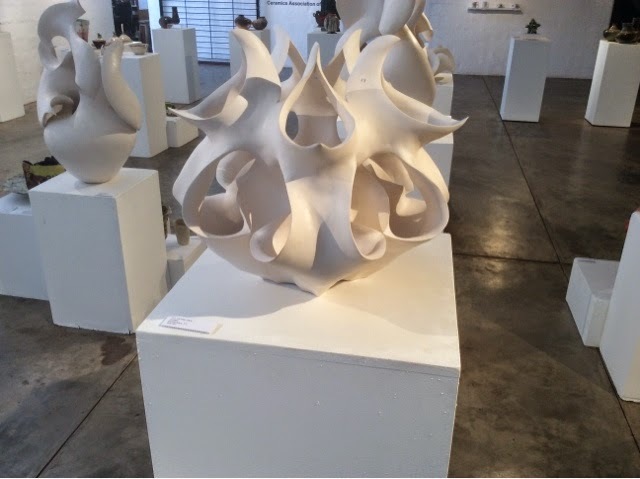 The artist stacks long coils of clay, spiraling upward. The artist will then smooth out the edges to create a smooth cylindrical object. 5. 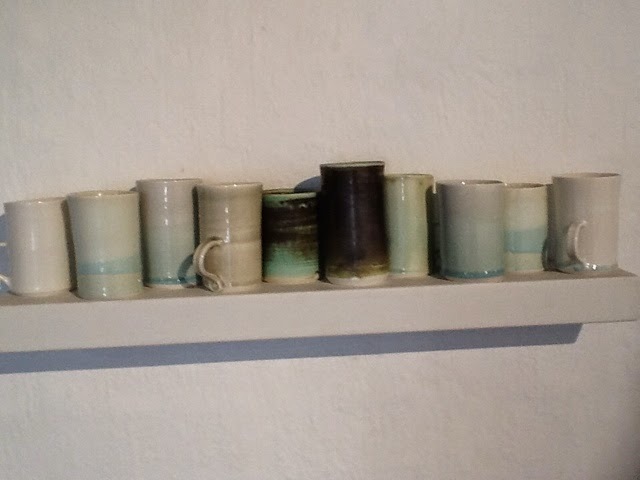 The piece consists of cylindrical mugs and they are glazed. 6. The cups are very well sculpted, as the heights vary and this gives them a sense of movement. The colours are tranquil and this caught my eye immediately. The different techniques the artist used to create movement throughout the cups and the contrasting shades of blue draws attention go the piece. 7. Colour. The colours used in the art piece are blues and greens. The colours are used to create a tranquil feeling throughout the piece. 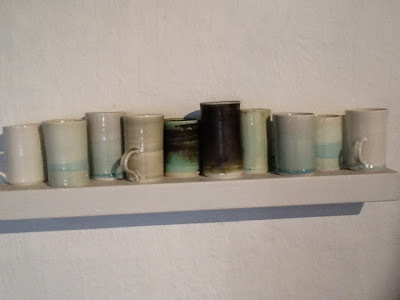 The artist also places the lighter mugs on the outside and the two darker mugs in the middle. This creates a focal point for the viewer. Line. The lines of the cups create a vertical movement. Texture. There is implied texture by the way the artist paints vertically using darker/lighter colours then the bass colour. The mugs are also painted wit glaze and thus would be given a smooth texture. Therefore there is infact some sort of smooth texture. 8. Yes the artist is well established. 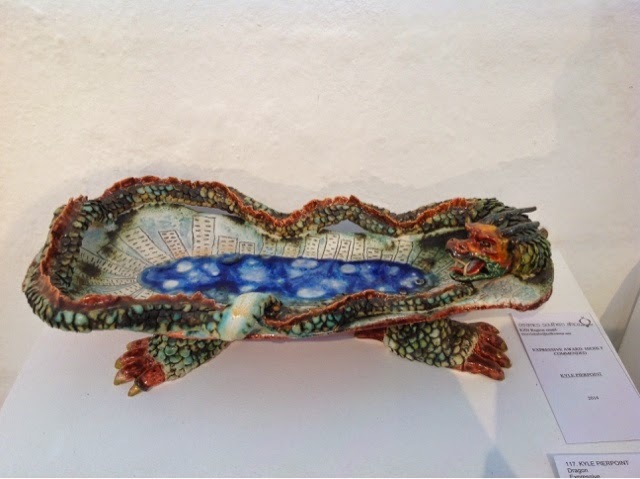 She received a highly commended award from the ceramics south Africa. 9. Yes, the cups are placed in a row directly at eye level, the way they are placed draws your eye directly to the first one and then across all of them. 4) I think the artists has used the coil method as the coil method can be used to make long cylindrical objects. 5) The shape of the vase is long and as it reaches the top it narrows then curves, the shape of the vase depicts the women on the vase, as the women's body has long legs and a curved waist. The glazed effect adds to the women's physique. Form would be a sculpture. 6) The art piece I chose is very mysterious, because of the mysteriousness i wanted to look deeper into the meaning of the piece, this revealing that the picture of the women imitates the shape of the vase. 7) colour: the colour of the vase adds emphasis to the meaning, the dark brown colour of the vase makes the silhouette women stand out making the curves of the vase stand out. Form: the main design of the vase is the women so because the vase is tall it makes me as a women feel powerful and strong. Line: this artwork is very curvy enhancing the womanly theme. 9) yes, the artwork has been displayed in its own space with nothing near it this making it the main focal point. 10)yes you can use it as a utensil.